Wild Blue Yonder, a mauve Grandiflora Rose, is a hybrid by Tom Carruth and another All America Rose Selection Winner for Tom. Wild Blue Yonder-as in 'off we go into the...'Not for the shy of heart. Warm wine-purple color, layered onto rich lavender with a strong citrus and rose scent. Sounds like an invitation to a wine tasting! Yum!! 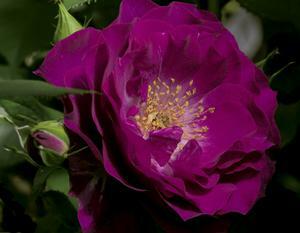 Wild Blue Yonder was the first lavender rose to win the AARS award since 1978. Go, Tom, go! Here's yet another fabulous AARS award-winning beauty from Mr. Carruth. Does the man never sleep? In fact, 'Wild Blue Yonder' is the first lavender-mauve rose to win the AARS award since 1978, which speaks highly of its exceptional disease resistance and vigor. The rich rosy lavender and warm velvety wine purple flowers have a ruffled camellia-like shape, and they bloom in such enormous clusters that on a young plant the canes may initially require some support. Whenever mine blooms, each flower in the huge cluster, and even each individual wavy pink-edged petal, seems to be a slightly different shade of lavender, which creates a dazzling and impressionistic effect. From a distance this rose almost looks like a beautiful light purple Hydrangea. The fragrance is strong and lovely, slow to build at first but deep and long lasting. The foliage is healthy, and the bush reblooms reliably following a brief rest between cycles. So far 'Wild Blue Yonder' has stood up remarkably well to Louisiana's brutal heat, torrential downpours, tropical hail, giant bugs, rampant fungal epidemics, and corrupt politicians. Just like a typical southern belle, it's tough as nails beneath its delicate grace and pretty face. My kind of rose!